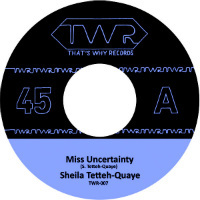 Rating: Here we go them – absolutely no doubt that Sheila Tetteh Quaye’s new funk 45 Miss Uncertainty is most definitely fire. Sheila Tetteh who? Nope, the monkey neither. This didn’t come in as a submission, it just hove into to view on the web and a quick stab at googling yielded nothing but dead-end Google+ and Facebook pages though there is an FB page for Swiss label That’s Why Records. Not that that leaves you much wiser – though it does provide a link to the video with, at the time of writing, precisely one comment on it – from the monkey. If there’s any justice, that will all change however. 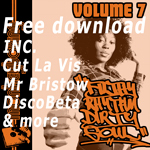 Miss Uncertainty opens with a crashing drum break before developing into a fat, guitar-led funky-soul groove topped with sister soul vocals while the flip, Soul Caesar, amounts to an instro version and is effectively Miss Uncertainty Pt 2. Get your skates on though, the 45 is only a 200 pressing.